I've taken a break from painting landscapes for the last couple of dates to paint some floral still lifes. I was given a book on Ikebana by a neighbour and this started me thinking about this month's challenge on the floral forum of wetcanvas.com. This painting is inspired by the book, the challenge and my imagination. 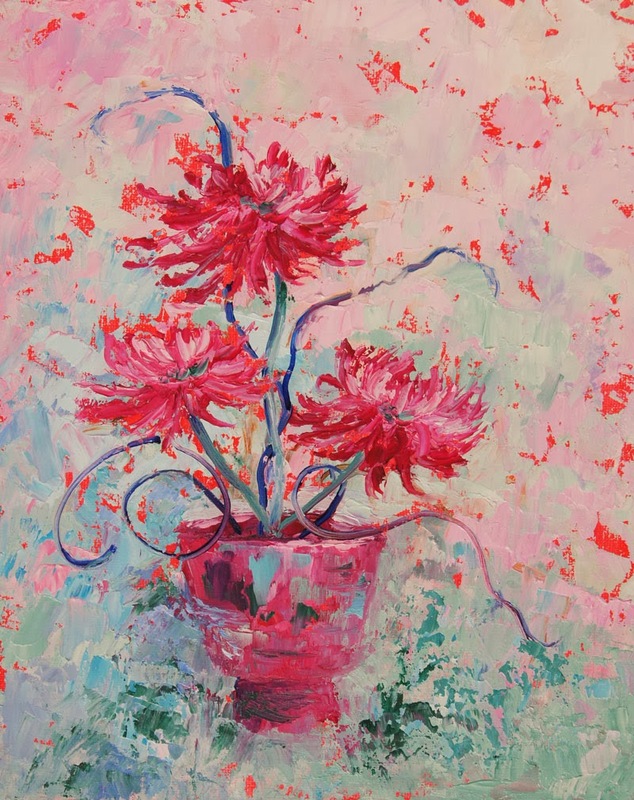 It is the first time I have painted chrysanths and I wanted to achieve an ethereal 'look' in the painting. I used a very limited palette and started with an indistinct background using my main colours. I liked the result, if I was to do it again, I would probably make the flowers larger and blend them in more with some of the green. What do you think? I liked the idea of using Ikebana as the basis of the painting and I have completed four paintings for the challenge so I will post another tomorrow. Give a gift of an original artwork, or gift certificate to family and friends. I will gladly gift wrap a painting and send it directly to the recipient with a gift tag.